Day 1 - 216.6 lbs. To Celebrate my 40 Pound Loss I thought I should have a giveaway! Two weeks ago I got a really great cookbook. It is called Hungry Girl 200 under 200. 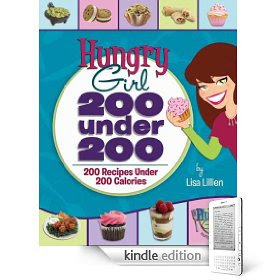 It is a cookbook with 200 recipes under 200 calories. I love it! It is my new favorite cookbook. I figured what better way to celebrate my 40 pound loss then to give one of these cookbooks to one lucky reader. 1. Leave a comment below telling me your favorite Cookbook. 2. Earn a second entry by being or becoming a follower/subscriber and leaving that in the comment section below. 3. Earn another entry by grabbing my button. 3. And another entry by making a post on your own blog telling everyone about this contest and linking it to this page. Then paste your link in the comment section below. I will be drawing the winner randomly on Monday, September 14, 2009. I will contact the winner by email. My favorite cookbook was a gift from my sister. The small town she lives in made a cookbook for their centenial celebration. You look beautiful Jessica! :) Keep up the great work! You look amazing! Congratulations on the weight loss. Favorite cookbook? An out of print cookbook called Superfoods by Jyl Steinbeck. It's great! Oh the first entry must be a lucky one!!! I love Giada's Family Dinners! Congratulations on your weight loss! You look like a new woman! I'm so happy for you, Jessica! Great giveaway - but don't enter me, because I won this cookbook from MizFit a few months ago. Love Hungry Girl - she has so many yummy ideas! You are doing fabulous & you look beautiful!! Keep it up!!! My fave cookbook, hmmm... honestly, I don't have one. *blush* Is that bad? LOL!! I'll find recipes from here and there, and just "healthy them up" to my own liking. Hi there!! My favorite cookbook is the one that I make from prints from blogs like yours! You look fab! I like the South Beach Diet quick and easy cookbook. You are added to my google reader! My favorite cookbook is the clean eating cookbook! My favorite cookbooks are the Americas Test Kitchen cookbooks. You look so great Jessica!! Well, I tend to rely more on recipe sites than cookbooks these days. My favorite book is actually a Betty Crocker one, not the traditional one, but a fast and easy one with lots of 20 minute meals. Though, I admit I am more drawn to the pretty pictures most of the time. My fave cookbook is Weight Watchers 20 Minute Recipes. It was a special release by Time, Inc., an it is AWESOME!!!!!! So much flavor, so little points! I'm a subscriber, too, via Google reader. 1 - Cook Yourself Thin ;; it has fantastic recipies!! 2 - Taste of Home! Oh I love my first Hungry Girl Cookbook!! Would love to win this one!!! Congrats on the 40 lbs girl! You look FAB!!! I am a follower! WOO HOO!!! My favorite cookbook is the better homes and gardens one - every single thing I have done out of it has turned out great! Now I give it for bridal shower gifts :) You look great!! Wow, you look great! 40 pounds makes a big difference! What a great give away! I bought that same cookbook several weeks ago and also love it. I've only tried three of the recipes so far, but they have all turned out to be really good. Not only are they easy to make, but they are delicious. My favorite cookbook is a family cookbook that one of my aunts made for me when I got married. She compiled a bunch of family recipes and favorite quotes and verses. I use it all the time! I would love have an inspiration to focus on myself for once and to help keep me going on the weightloss track. :) Thanks for the opportunity. I am a follower on my yahoo reader..
Wowza! First off you look DYNOMITE!!! Seriously, you look gorgeous!!!! I love the dress, very flattering...and look at you...WOWOWOW!!! What fun! Thanks for giving us the opportunity! My favorite cookbook is actually a weight watcher's cookbook. I'm not a member of WW, but I somehow ended up with this book and LOVE it...it allows me to make healthy, delicious things fast...several of the recipes have been added to our regular "rotation!" Wow great job on all your weight loss. I don't have a favorite cook book per se - tend to just print recipes online. I do love the Taste of Home stuff though! Looks like a great cookbook! I hope this second entry is legit....I subscribe in my reader already!!! My favorite cookbook is the good old fashioned Betty Crocker cookbook. I love the Barefoot Contessa's cookbooks. Not really healthy eating friendly though. Congratulations on reaching such an amazing goal! My favorite cookbook would have to be an old church one given to me by my mom when I was seven years old. It has so many great recipes in it! My favorite cookbook is the Weight Watchers Momentum cookbook. It has super fast and easy recipes. You look great; keep up the good work! My favorite cookbook is The I Hate to Cookbook. You look just fantastic! Congratulations on losing the weight. My favorite cookbook would be either my crockpot cookbook or I have a cookbook called 4 Ingredient Recipes (so cheap and easy with only 4 ingredients!). Thanks for the giveaway, it is so motivating to read your blog! Congratulations! Good job. My fave cookbook is 'Betty Crocker'. My favorite cookbook is "Farmhouse Cookbook" by Susan Herrmann Loomis. My favorite cookbook is my hometown's cookbook (Misawa Air Base, Japan).. lots of yummy recipes from all over. This book is something I need as I am trying to lose some weight. I love all the books by Racheal Ray. I try to tweak them and make them healthy, when I can. Though sometimes her stuff is already pretty point friendly. And PS Good for you! You are just knocking that weight off like crazy! Doing a happy dance for you! I love those little cookbooks you get from Pampered Chef for $1. They have great recipes! I subscribe to you via google reader. Thanks. My favorite cookbook is the Junior League cookbook from Wichita, Ks. I have about 100 cookbook and this is by far my favorite! I love just a simple Betty Crocker cookbook. I cook from scratch a lot so this book is extremely helpful. Please enter me in the contest! My favorite cookbook is any Taste of Home books! Love it! I also love your blog! Congrats on the 40 pounds!!!! Way to go! YOu looked beautiful in the wedding! I have several WW cookbooks that I really like. Right now, my favorite cookbook is South Beach ,the one with the yellow cover. I also just started following you the other day...you are looking good girl ! Great giveaway! My favorite cookbook has to be my grandmas Fannie Farmer cookbook. Hardly a healthy recipe in it, but it has all her handwritten notes on why this recipe worked, and what she did different in the next one. I've never met a cookbook I didn't like but my "More with Less" cookbook is one of my go-to books. To be honest, I don't have a favorite cookbook, but my mother in law made me a great recipe box full of delicious recipes! Congrats. You inspire me. My favorite cookbook is The Most Decadent Diet Ever. Everything is so good tasting but no bad for you. I love Hungry Girl and would love to win this cookbook. And I missed this post last week, but your update pic looks AWESOME. WTG! (And your daughter is adorable.) I am a follower too. I love the Betty Crocker cookbook. I use it all the time.